Hey everybody! I just wanted to make a quick announcement! Using random.org I picked the two winners of my 200 Follower Giveaway! Prize 1 is going to Rachel Arthur, and Prize 2 is going to TrailerHood Chic! Congratulations to you both!! Don't forget my 300 Follower Giveaway is still going, and I am planning a big 500 Follower Giveaway! 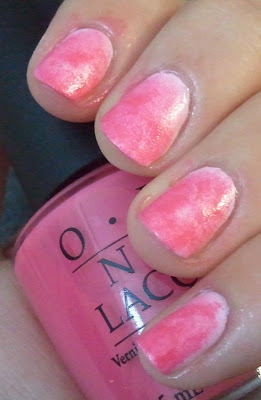 Thank you to each and every one of you for following my blog and sharing in the love of nail polish! Holy moly everybody! It's been a while! Last Saturday I left for San Antonio for a business trip. It went great, and I LOVE TX! It was my first time there, and I seriously have a thing for San Antonio. 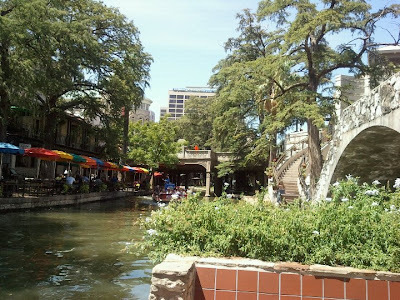 I got to explore the Riverwalk and visit the Alamo... it was great! I got back yesterday and am trying to get back in the swing of things. I have another business trip the second week of August, and then, I'm moving to California the last week... if I am not around for a while, please forgive me! I just have a lot going on during the month of August, and planning this move across the country is not helping my stress level! Today I wanted to share with you a crazy tape design based off of a previous color I had already shown you. 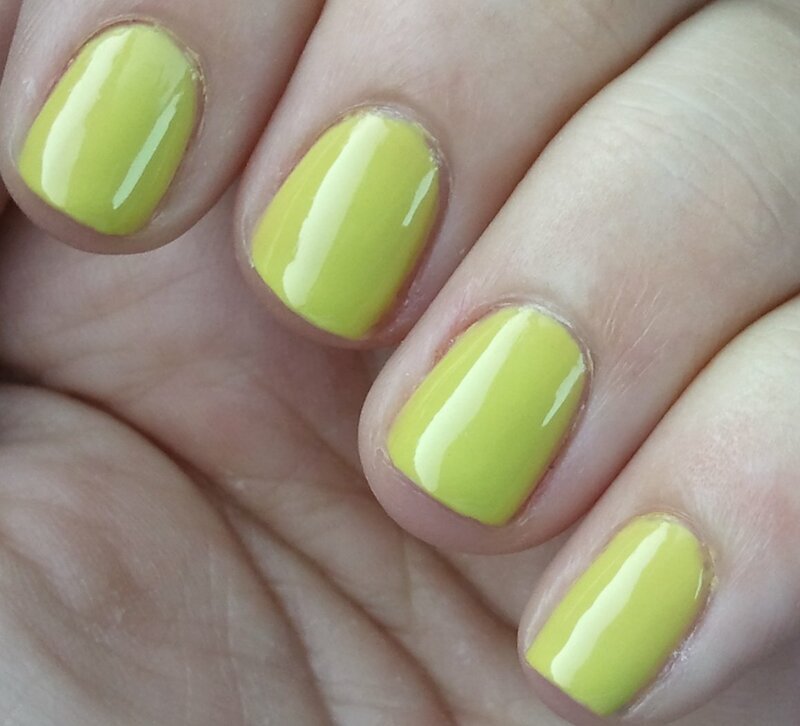 Last week I had on Electric Pineapple from China Glaze, and before I took that color off I decided to expand on it a little bit. 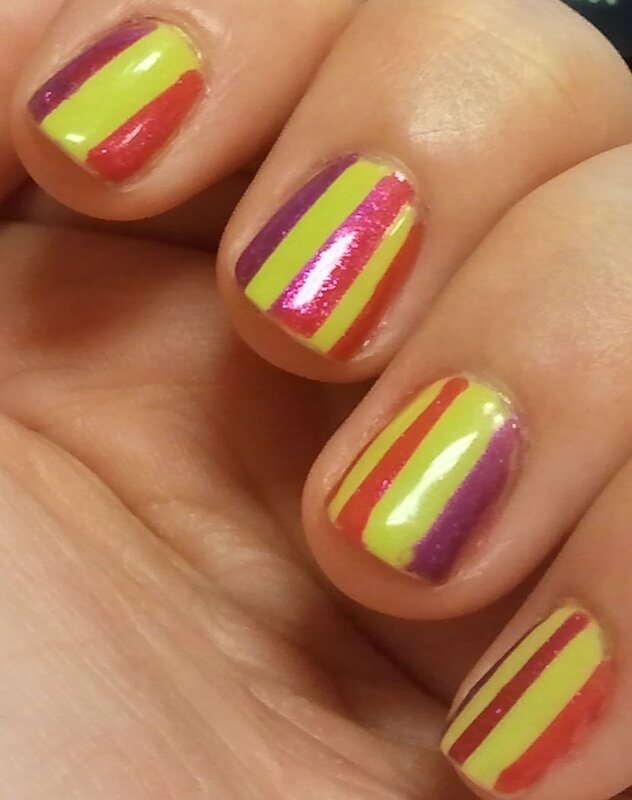 I added stripes of 108 Degrees and Senorita Bonita (both by China Glaze and also from the Island Escape Collection) over the Electric Pineapple and thought it made for a fun, funky wallpaper looking design! Happy Friday everybody! 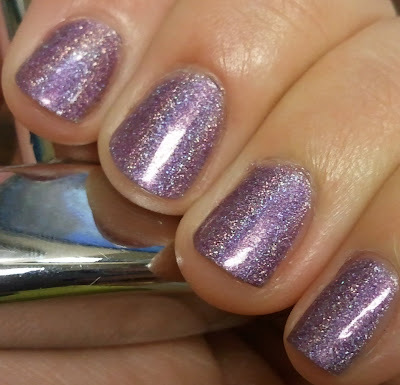 Have you ever walked into a store, saw a polish that looked absolutely GORGEOUS in the bottle, and bought it on the spot? Then, when you get home, so eager to paint the glorious beauty on your nails, experience utter disappointment? The polish is thin and almost invisible, and you feel as though you might as well have painted water on your nails? Well, this post is for you, my friend! All hope may not be lost! There is a well known trick/secret amongst the nail polish community, and that, is black nail polish. Yep, that's it! Just black lacquer! It doesn't have to be anything fancy, in fact, the cheaper [as long as it is opaque in two coats] the better, because the black is just the catalyst for your poor, sad nail polish to show it's true pop of color! Duo/Multi Chromes really benefit from the black polish trick. You can usually see every facet of color over black, and it really makes each shade stand out depending on the angle of your nails. 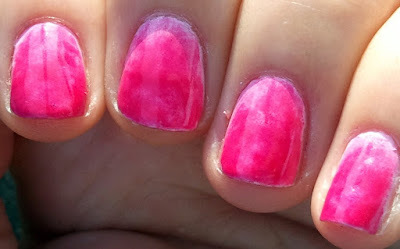 Here are some examples of how black can transform different colors of polish. Unfortunately I don't have swatches of all of these colors on their own... I can make a swatch wheel for you, or you can google the colors and will mostly likely be able to see how they fare on their own two feet. I love looking at these pictures and seeing the magic transformation of colors that, on their own, are nothing special, but when layered over black, become a magic, enchanting display of razzle-dazzling beauty. This is very picture heavy, so if you want to see more, click below! Man! Time is just flying by! 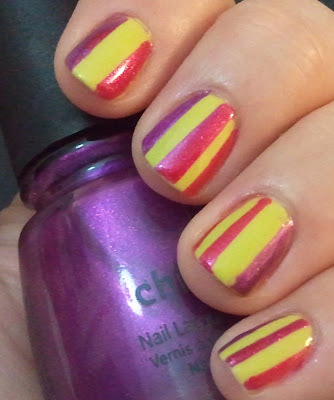 I wanted to do something different this go-around, so I thought I'd try a gradient, sponging design. Basically, you grab a few polishes that are different shades of the same color. You can start with the darkest color or the lightest color, and then you stamp on the other colors over it to get a somewhat blended gradient of color and your nail should look like the colors fade into one other. Or, that's my impression of this look at least. I started with OPI 'Mod About You'. First time I've used this color, and I really like it! I think it's going to be a color I'm going to get a lot of use out of because it's work appropriate and since I will soon be working out of my company's main office, it will probably come in handy! 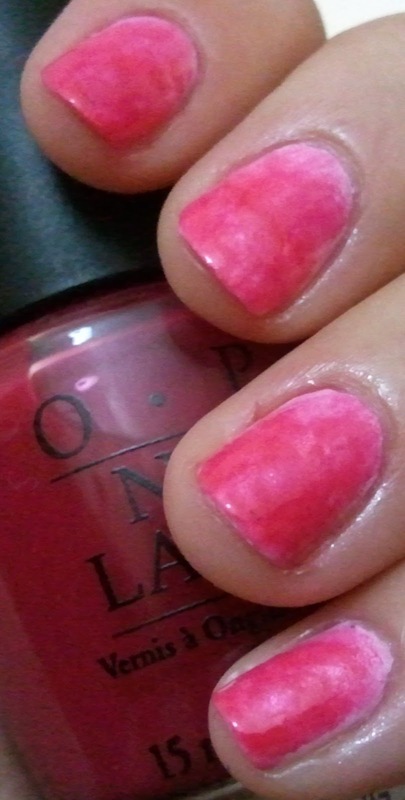 I then used the corner of a makeup wedge to stamp on OPI 'Princess' Rule'. You can't even see it in the pictures, and quite honestly, this polish could have been eliminated from this look completely. 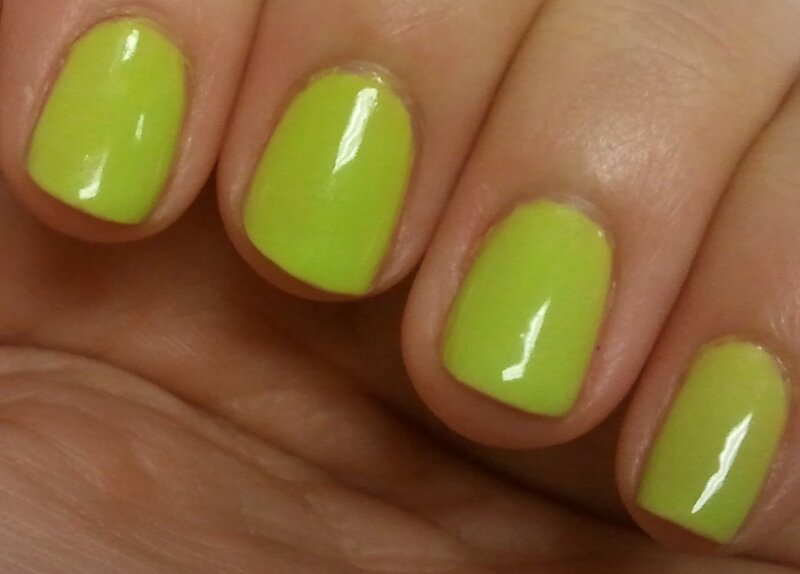 All it contributes is a very subtle "glow" from underneath the next two layers of polish. 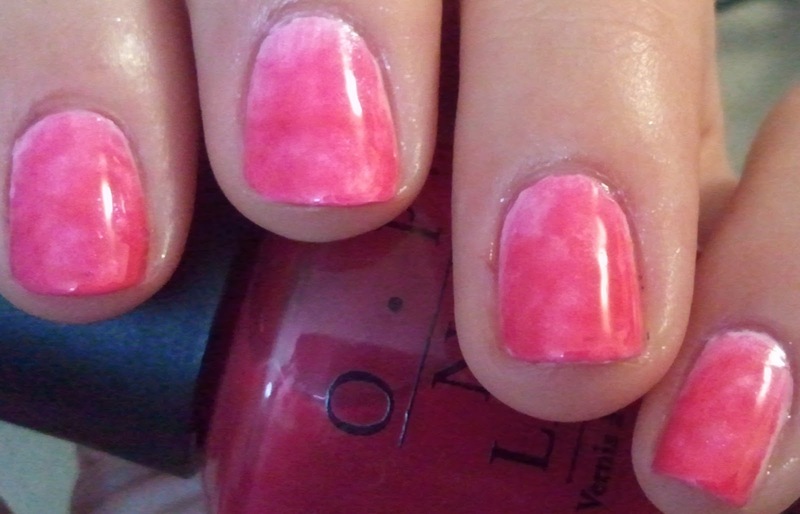 The third color I used was OPI 'Strawberry Margarita'. 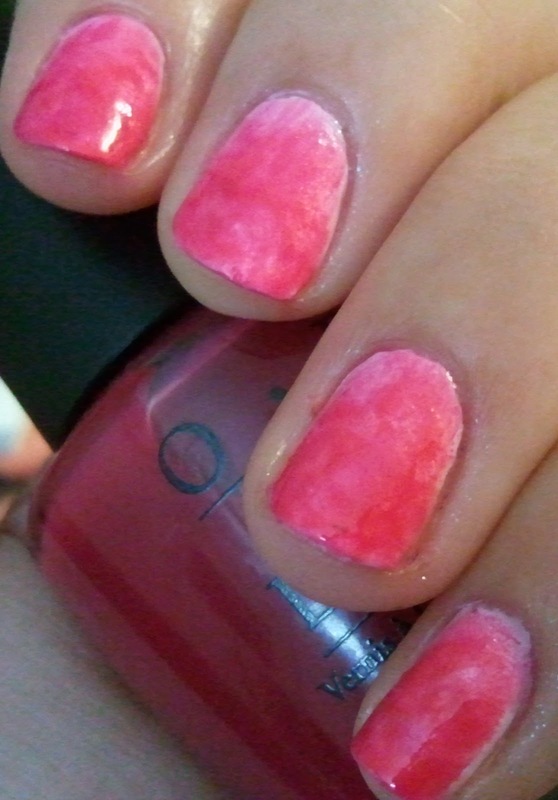 The last color I sponged with is OPI 'Too Hot Pink To Hold 'Em'. When all was said and done, I really like how this ended up looking. Maybe not the perfect gradient, but I think it looks cool none-the-less! I'll update with the name of the third polish tonight! 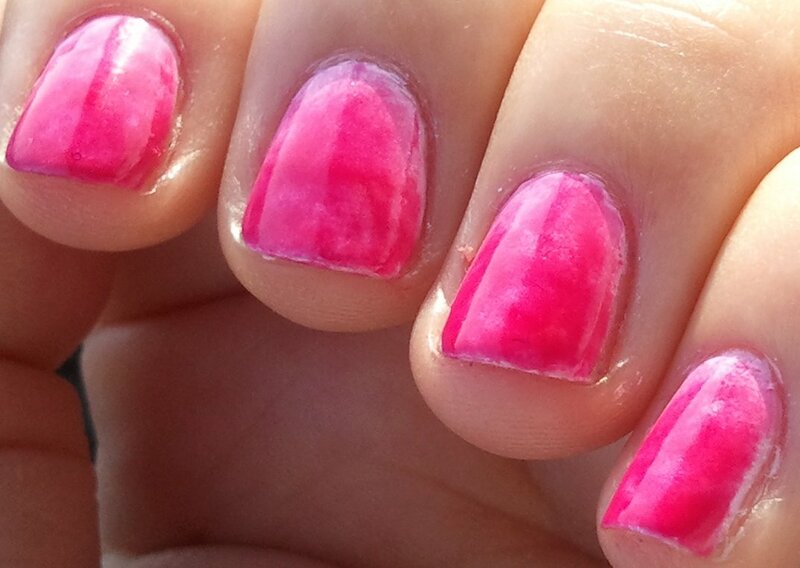 Taking pictures in the direct sunlight makes my cuticles look horrible and macro doesn't help. I wasn't going to use this picture, but the color looks awesome! Hi everyone!! I know I still have my 200 Follower giveaway open, but since I'm almost out of the 300s, I wanted to do another one! This one is smaller, but I think the prizes are pretty good! 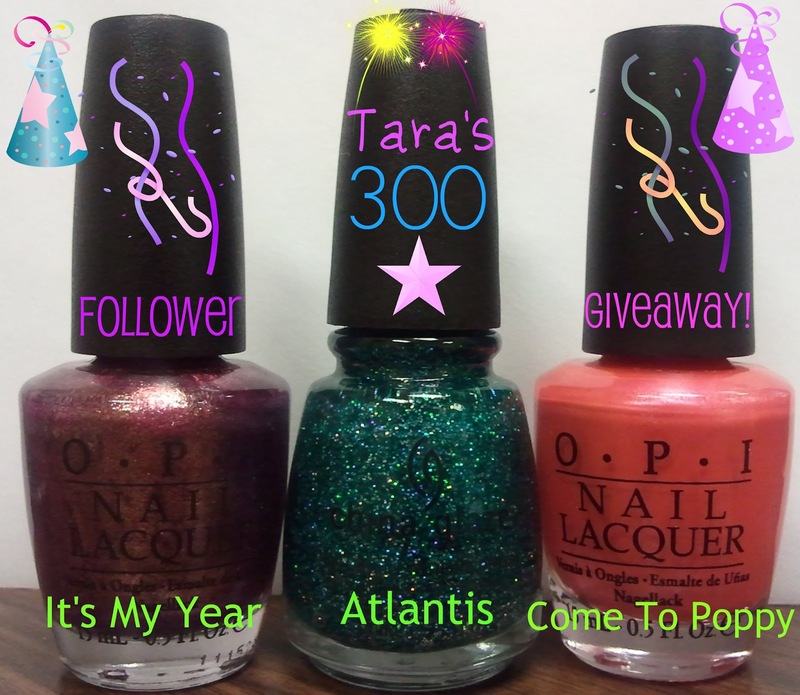 I will have just one winner this time, but I'm gearing up for the 400 Follower Giveaway, so stay tuned! Thank you as always for supporting my blog. It means a lot to me, and I really enjoy sharing my passion of polish with you! I love reading your comments and appreciate everything you say! So, thank you again!! 4) This giveaway will close on Sunday, August 7th, 2011 11:59 pm CST. Hi guys! Last night I was looking through colors I haven't used yet, and I realized I hadn't tried Butter London's 'No More Waity, Katie'. I got it from Ulta in the kit that had the polish and a mini bottle of polish remover (which I haven't tried because of the horror stories I've heard about it smelling like old lady perfume!). 'No More Waity, Katie' was created in celebration of the royal wedding. It's a gray/dusty/purple color with purple glitter. 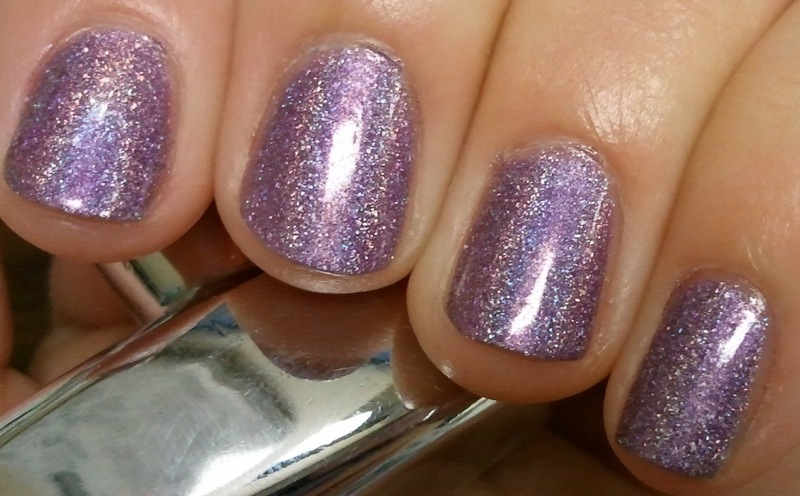 It's a sort of jelly polish, and the glitter suspends itself throughout, so the polish looks like it has a lot of depth to it. The formula on this wasn't all that great... it was really sheer at first, which was fine, and after the second/third coat was much better. The problem I had was it didn't spread across the nail that easily, which made it really difficult for me to get coverage on the sides of my nail. As I tried to spread the polish all the way to the edge, it just got on my skin instead. I don't know if the glitter got in the way, but the brush just wouldn't flatten and spread the polish out the way I needed it to. Also, the cleanup with this was frustrating. 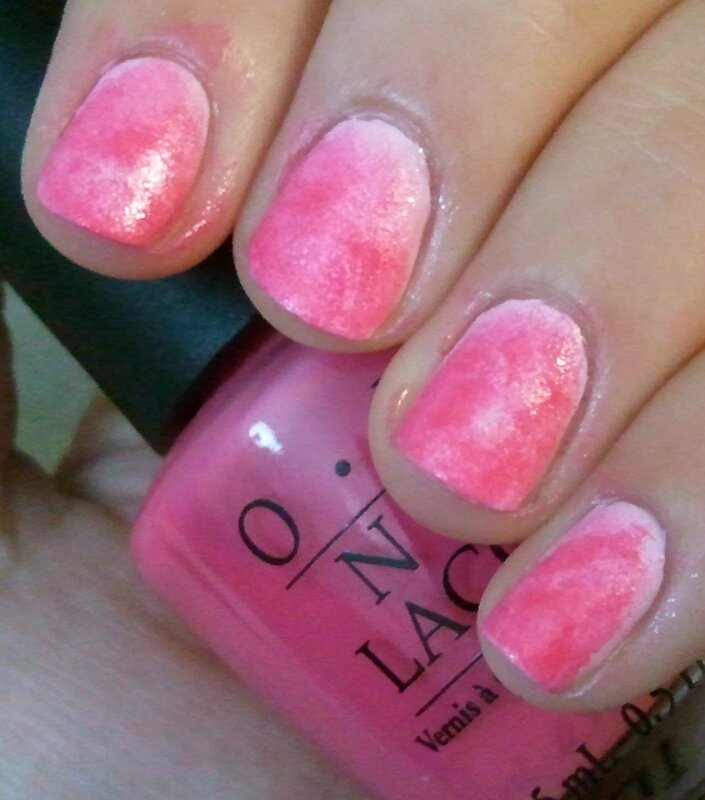 I dip a small brush in acetone and can usually clean up around my cuticles pretty easily. The glitter on this didn't want to budge and I still have spots of glitter around my nail. I like the color, but it's not my favorite. I was kind of bored with this color on its own, so I decided to spice it up a little bit. I really LOVE Octa-Gone-Wild so I did a diagonal scotch tape design and spiced things up a bit. Hi everybody! Happy Monday!! I am back from my mini vacay, and it was JAM PACKED! I arrived Thursday night, and Brooke picked me up from the airport. We had dinner at my aunts and I got to see my cousin, Carla, which was so awesome! Hi Carla!! :) Love you and miss you already! The next day Brooke and I met up with Traci from The Trace Face Philes, and Cassandra from The Manilogues! We went to a bunch of supply stores in Philly, and it was awesome!! It was so nice to meet up with fellow bloggers and get some good deals on polish! On Saturday I got to see all of my mom's side of my family! We all went out to dinner to celebrate my grandmother's 80th birthday! It was a lot of fun, and I got to hang with my cousins... Hi Tommy, Kristina, and Karla!!!! <3 The next day my family drove up to CT to visit more family. I got to see my other grandmother and more cousins and aunts and uncles (Can you tell I'm Italian!?) and it was so great to see everyone. It's so difficult to say goodbye, but worth every second of seeing them. 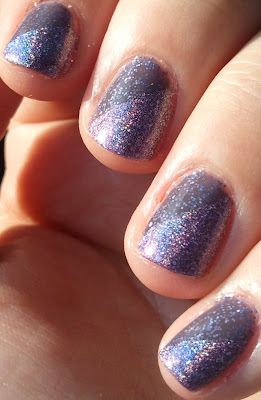 Today I wanted to share Color Club's Covered in Diamonds. It's tons of large, iridescent flakes in a clear base. 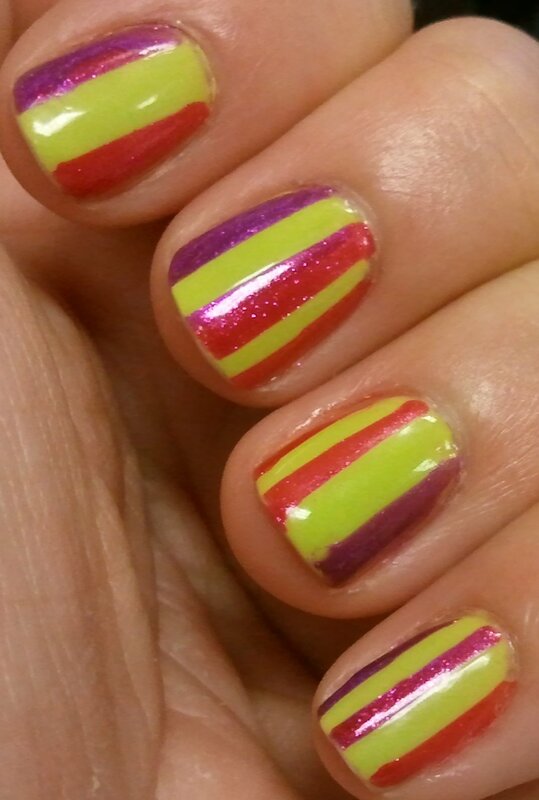 It reminds me of stained glass on the nail. 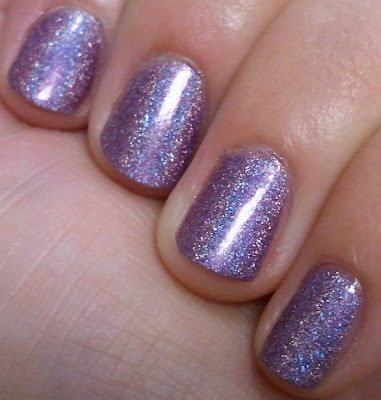 The only thing with this polish, is that the flakes are so large they can curl up and stick up off of your nail. It takes about two top coats to smooth everything out... probably a top coat of gelous would be good, but I only used Seche Vite. 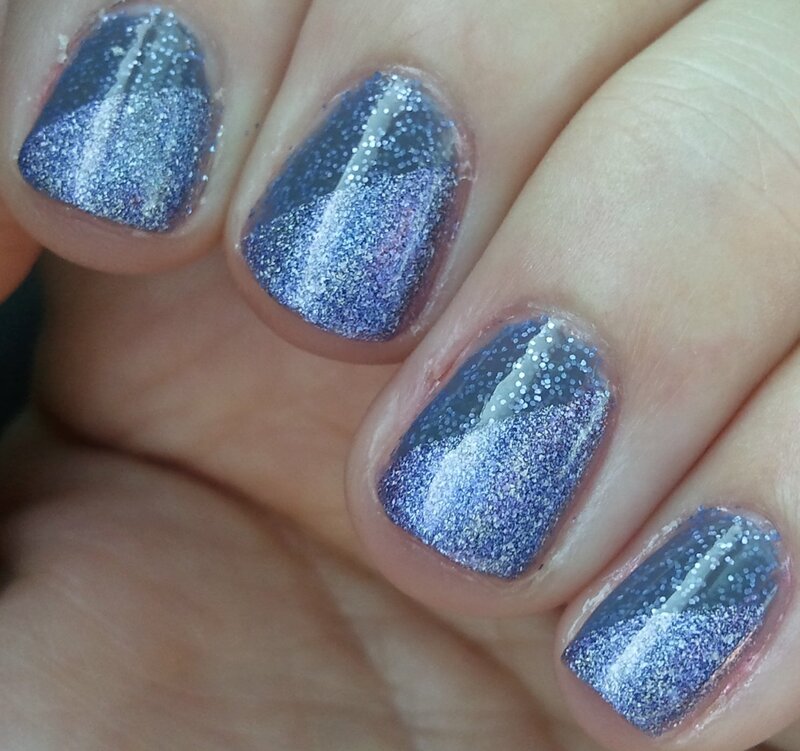 I have Nubar's Pasadena Purple on underneath, and I really need to do a post of that color on its own. It's gorgeous! But as you can see I have some tip wear, so I really want to give the color the proper credit it deserves. Hey everybody! Last night I was packing for my weekend trip back to Jersey, for my Nana's 80th Birthday, and was trying to think of what polish to use to kick off my trip. I scoured my polish racks and picked a few up to pack - Essie 'Nice is Nice', and Orly 'Flirty', and China Glaze 'Pool Party', and then my eyes ran across it - the perfect polish to start my trip! (That totally reminded me of SNL Cheerleaders with Will Ferrell and Cheri Oteri - THE PERFECT CHEER!) 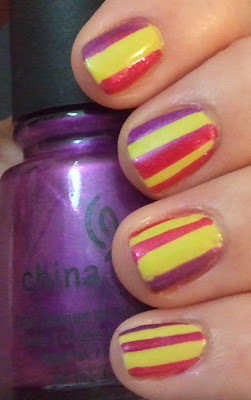 Anyway, on went China Glaze's 'Octa-Gone-Wild' from the Kaleidoscope Collection. It's purple and holographic and I can't think of too many things better than that! It was like 11:30 last night so I didn't have any sun to capture the beauty, so here are some pics form my phone that do even do it justice, but give a hint at the glorious-ness of it all. Hi guys! Today is a continuation of yesterday's post. 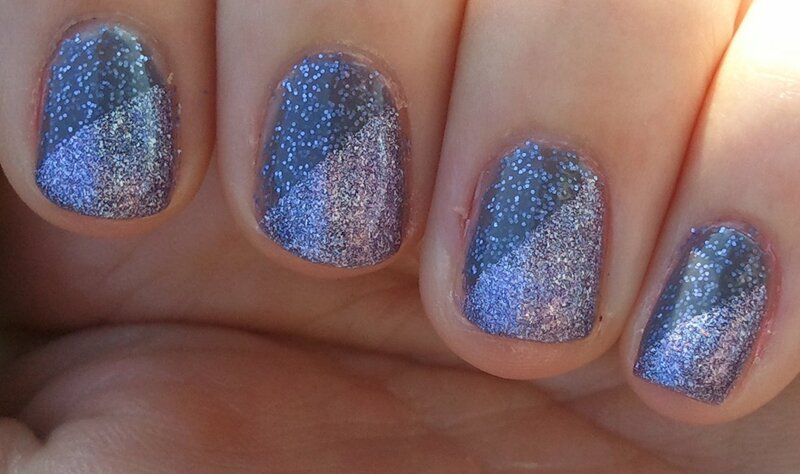 Here is OPI's 'It's My Year" on my nails, instead of the nail wheel! I like this color, I just wish it wasn't so close to the other two I have! None the less, the formula is pretty good and covers in two coats. So... here you go!